Right outside the busy corridor of Tyson’s Corner in McLean, Virginia is J. Gilbert’s Steakhouse. Known for their menu of prime steaks and fresh seafood, J. Gilbert’s strives to deliver honest food with quality ingredients. The ambiance of J. Gilbert’s is really special; it’s sophisticated and classy. Immediately, as you walk in, you’re hit with the aroma of smoked wood, which gives the vibe of a rustic cabin deep in the smoky mountains. We have been to this wood-fired restaurant on several occasions and recently planned a romantic dinner there to celebrate Jason’s birthday. I made our reservation on a last minute whim through Opentable.com. It was easy and quick, plus I was able to be discrete in doing so – making dinner reservations a special surprise. Once I made the reservation, I got a pop up message asking if this was a special occasion and I noted that it was Jason’s birthday. I really loved that the restaurant selected to use this feature, because it made me feel like they wanted to go out of their way to know what was special about that evening. Let me start with the service. The food can be amazing, but what makes a restaurant really special is the professionalism behind their staff. Let’s just say our server lacked in skills that are necessary in a higher-end restaurant. I ordered hot tea, but I wasn’t offered any condiments, I had to ask. He didn’t mention any specials, I had to ask. We had to remind him to refill our drinks and bring out salt/pepper. A dessert menu wasn’t offered and our reservation was noted to celebrate a special occasion. When I paid for the bill, I used a “Happy Birthday” coupon and the server didn’t recognize my husband by saying “Happy Birthday.” It’s those little things that add to a pleasant experience and our server was clearly there just to punch a ticket. The service at J. Gilbert’s was truly disappointing on this visit. Let me continue on to the food. My heart was really set on grilled shrimp and I was really looking forward to seeing what J. Gilbert’s had to offer. Jason wanted a simple steak and he quickly found a match on the menu. I was not so lucky. I of course asked the server for suggestions, but he couldn’t be bothered to offer any suggestions. I noticed at the bottom of the menu that grilled shrimp was offered as an add on to their steaks. So, I ended up ordering the baby greens salad with an add on of the grilled honey bourbon shrimp and a side of their roasted mushrooms. The salad included pine nuts and sweet dried cherries with a sprinkle of parmigiano reggiano. The combination of this salad with the grilled honey bourbon shrimp was a perfect paring and every bite was genius. The sweet and smoky flavor of the shrimp really played really well with the tart cherries and buttery pine nuts. My only criticism is that they charged $10 for the shrimp and I only got 3. I will note that they were big and beautiful (and perfectly cooked) but I would have liked to have seen 6 of them. If I were J. Gilbert’s, I would include that salad as an entrée item on the menu. They can, of course, call it The Stricker Salad. Oh, let me not forget the roasted mushrooms – another perfect paring to my salad and they were to die for. They were rich and meaty, seasoned with just the right amount of herbs, salt and pepper. I really didn’t want to stop eating them. Plus, I give an A+ for plating, as they came out on this cute little skillet that matched so well with the restaurants ambiance. 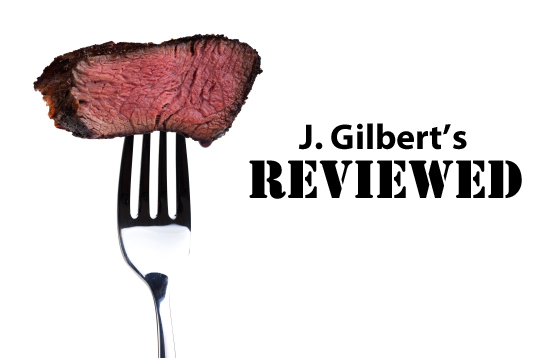 If you are looking for incredible wood-fired steaks without the fuss (or high bill) of a Morton’s or Ruth’s Chris, I would highly recommend checking out J. Gilbert’s. They truly have passion behind their menu. As we were seated, I wondered why they aren’t on Northern Virginia Magazines top 50 list, but by the end of the evening my question was quickly answered. They aren’t on the list because their service isn’t stellar. If I was to rate J. Gilbert’s I would give them 2.5, maybe a 3 out of 5. Wood-fired, smoky steak. Enough said, right guys? I’ve been dining at J. Gilbert’s for well over ten years and can’t remember having a bad meal. With steak being one of my favorite meals, I frequent the area’s nicer steakhouses as often as I can. I’ve always viewed J. Gilbert’s as one of my staple, go-to steakhouses that doesn’t come with the pomp and stuffiness of other higher-end places. So, if I’m in the mood for a good steak, but want to dine in a more relaxed, smart casual environment, J. Gilbert’s is on my short list. While Tinsley is correct that service on our most recent visit was deplorable, it was a rare occassion in my opinion. I admit service isn’t on par with some other steakhouses, but I’m not as much of a stickler when it comes to service. As long as my food is properly prepared, my drink is full and I’m with good company, I tend not to complain. Given J. Gilbert’s has been a steakhouse staple for me for over a decade, I rate it a very solid 3 out of 5.